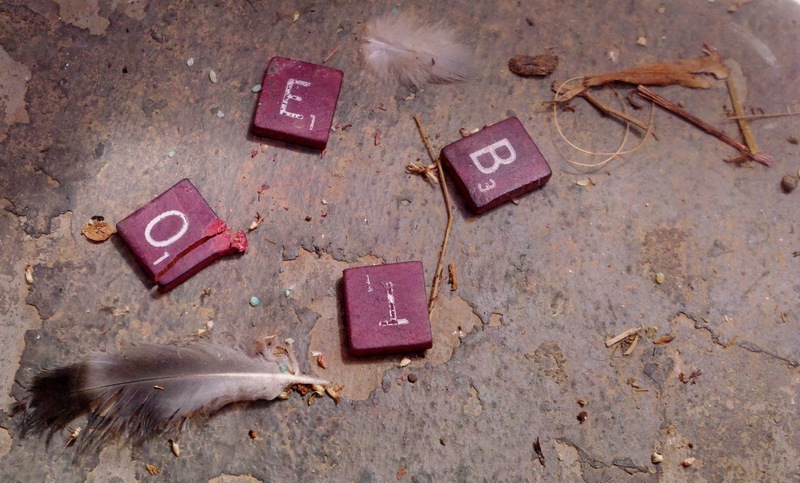 I think this is a really cool picture, not least because it taught me some thing I never knew: that a Scrabble tile can crack. I have never seen that before, not even among the old unfinished wooden ones. They seemed like the most solid things humankind has ever come up with. And yet there rests the "O", cracked as clear as anything. I guess you learn this stuff when you look at scaly paint and lost feathers enough. Really cool pic, JR. The lighting is great too, though I can't figure out why. No irony there; just think it's cool. Hey Mike! Sorry I haven't been able to respond to your great comments on my other posts. I left an explanation on your blog post of the great photo of the deer on the hillside. This is one of those photos that literally popped out at me. I was dumping the trash and looked down and they were on the ground, just as you see it, feathers and all. The light is natural sunlight slightly filtered by the canvas canopy top of the enclosure the dumpsters are kept in. I snapped the shots, uploaded them from my phone then and went right back to my house to see what I had captured. Cool how that stuff happens huh? LOL at your take on the words and Ed Sullivan's pronunciation of "Beatles!" Priceless. Thanks for looking and commenting.